1. To provide people across the globe with anthropological data and ideas that they probably would not receive had we not provided it. 2. To give social scientists the opportunity to actually have their research read. Most manuscripts are merely glanced through. 3. To eventually publish the online magazine in a variety of languages, including but not limited to: Spanish, French, Portuguese, German, and Arabic. Knowledge does not belong to English-speaking people only. 4. We will always be a FREE magazine so that the public and universities around the world can have access to important manuscripts. However, in areas that do not have access to the internet, we would like to someday publish the magazine in hard copy and distribute the magazine free of charge to low-income university libraries. 5. To obtain a healthy number of advertisers in order to become a paying market. We want to be able to pay scholars for submitting their articles to the magazine AND to set up scholarships and fellowships for undergraduate and graduate students in the social sciences; these scholarships and fellowships will be available to students of every nation, ethnicity, gender, and religion. We would also like to be able to provide traveling expenses for non-US scholars to travel to association meetings and conferences who would not be able to attend otherwise. 6. To incorporate as a not-for-profit. 1. To maintain a Theses and Dissertations Database from around the world, free of charge, through our website. It is extremely difficult for US citizens who are not in academia to access theses and dissertations published in the United States. However, it is even more difficult for non-US citizens to get a hold of and read these records. Likewise, most non-US theses and dissertations are unavailable to people in the United States. The data included in these manuscripts took years to conduct and complete. Although some of these works eventually turn into published monographs, many “lay on the shelf collecting dust.” This is something Popular Anthropology Magazine seeks to change. Submission to the database will be voluntary. Below you will find three links for each issue: a Flash-Flip online version, a Flash-Flip download version, and a PDF version. Each issue will be uploaded to the archive after the subsequent issue has been published. For example, as soon as the September issue is sent to subscribers, the June issue will be uploaded to the archives. If you would like to receive current issues mailed directly to your email inbox, you can subscribe free of charge on the homepage. This update includes many books relating to antiquity. Click here to download the forthcoming list as an Excel spreadsheet sortable by author, title, or ISBN. An earlier posting in AWOL: The Ancient World in ACLS Humanities E-Book includes those titles in the collection relating to the ancient world, known by me. If you are within a subscribing domain or proxy server or if you are a subscribing individual you should be able to get access via the links I've given. If not, you or your institution will need to subscribe. That list has 244 items. I'll update it when the new set goes live. This e-journal will publish the proceedings of the Athens Dialogues Conference, which will take place on November 24-27 in Athens Greece. The Athens Dialogues E-Journal is jointly sponsored by the Center for Hellenic Studies in Washington, D.C. Assembled by Patrologia: Latina, Graeca & Orientalis, the volumes of this series available in some big editorial projects as Googlebooks and Internet Archive have been ordered and gathered in a single Scribd’ account. This is a more complete list of links than the one assembled by Roger Pearse and noted here a year ago. I realize I've missed a trick by not posting this during Open Access Week. I've been meaning for a while to canvass this list regarding open licensed Classical data--not just texts that can be freely read online in HTML or PDF, say, but text or data released under a license (Creative Commons, GPL, etc.) that explicitly allows the creative and transformative re-use of the underlying code (XML, RDF, images, etc.). I started compiling this list for a developers' challenge that we held back in July, and am particularly interested in the possibility of archiving and re-using this sort of material. LD is for, after all), but may not have explicit licenses. If anybody has or knows of datasets that should be added to either of these lists, please send them to the list (or ask me and I'll give you permission to edit the Google spreadsheets). Papyri.info is dedicated to the study of ancient papyrological documents. It offers links to papyrological resources, a customized search engine (called the Papyrological Navigator) capable of retrieving information from multiple related collections, and an editing application, the Papyrological Editor, which contributors can use to suggest emendations to PN texts. The Papyrological Navigator aggregates and displays information from the Advanced Papyrological Information System (APIS), the Duke Databank of Documentary Papyri (DDbDP) and the Heidelberger Gesamtverzeichnis der griechischen Papyrusurkunden Ägyptens (HGV), as well as links to Trismegistos. PN 2.0 is a complete rewrite of the PN system, with tight integration of the data, display, and search capabilities. All of the Duke Databank and HGV texts are released under a Creative Commons Attribution license and the APIS data is released under a Creative Commons Attribution-Noncommercial license. We hope you will enjoy using the new system. Look for more frequent updates in the future! 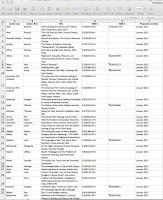 I first assembled the List of Open Access Journals in Ancient Studies in observance of Open Access Week 2009. It was based on journals cited in AWOL since its beginning in January 2009 . At that time the list included more than two hundred titles - a surprisingly large number - or so I thought at the time. In an effort to make the List canonical and comprehensive, I began adding additional journals in groups of twenty. All (or nearly all) of these have been accessible via Abzu for varying lengths of time. This process offered me the opportunity to verify all the links and repair the broken ones. 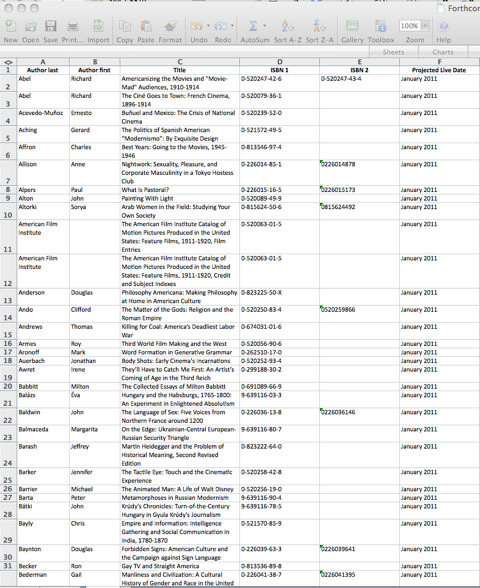 On February 17, 2010 the list reached six hundred titles, and the post date was updated. On July 7, 2010 the list reached seven hundred titles, and the post date was updated. On its first anniversary, and in honor of Open Access Week 2010, I am again updated the post date, though the link remains stable. At that time I removed the version history from the main list and placed it here. On May 5, 2011, with the addition of Engramma the list reached nine hundred titles and the post date was updated. On September 28, 2011, the list reached one thousand titles, and the post date was updated on October 1st, 2011. On February 14, 2012, with the addition of Arqueología y Territorio: Revista del Programa de Doctorado "Arqueología y Territorio", the list reached eleven hundred titles, and the post date was updated. On May 5, 2015, with the addition of The Journal of Jewish Lore and Philosophy, the list passed fifteen hundred titles. On May 19th, Day of Digital Humanities 2015 (#dayofDH2015), the post date was updated. On December 25, 2015, the post was updated. On 21 January 2016, with the addition of Μακεδονικά - Makedonika, the list passed the 1600 title mark and was updated. I trust that users of the list will offer suggestions for correction of errors and addition of new titles in the comment field available at the bottom of the main list at List of Open Access Journals in Ancient Studies. 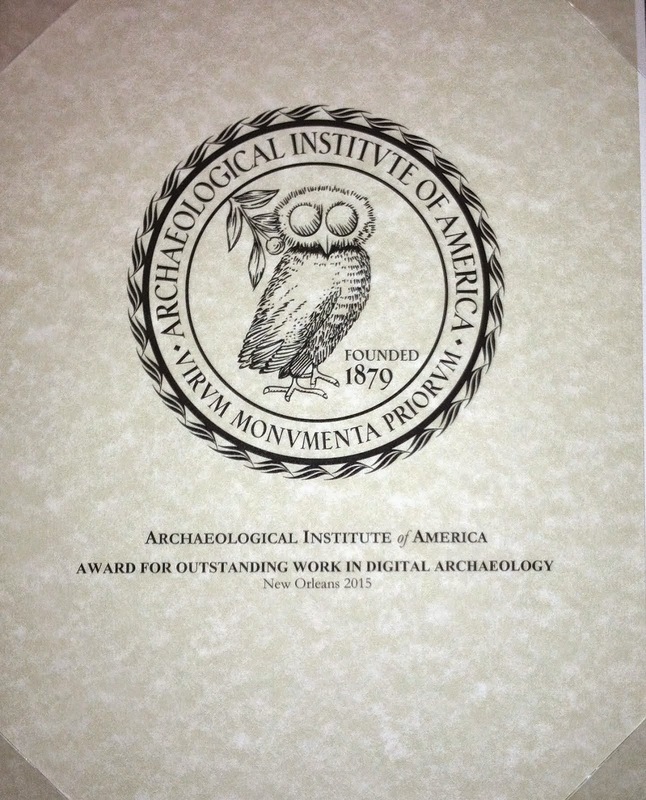 CLIR and Tufts University are engaging scholars and academic librarians in examining the services and digital objects classicists have developed, the future needs of the discipline, and the roles of libraries and other curatorial institutions in fostering the infrastructure on which the core intellectual activities of classics and many other disciplines depend. We envision a set of shared services layered over a distributed storage architecture that is seamless to end users, allows multiple contributors, and leverages institutional resources and facilities. Much of this architecture exists at individual projects and institutions; the challenge is to identify the suite of shared services to be developed. Prior research supported by public and private agencies has created digital resources in classics, which are arguably the most developed and interconnected set of collections and associated services in any discipline outside of the sciences. Questions now posed test the limits of project-based services. The findings of the Blue Ribbon Task Force on Sustainable Digital Preservation and Access, the Library of Congress National Digital Information Infrastructure and Preservation Program (NDIIPP), and two symposia hosted by CLIR (the second with co-sponsorship by NEH) demonstrate that managing digital information requires libraries to play an active role in the research process to ensure appropriate curation and preservation of digital resources. This project will help library professionals understand the challenges of supporting new kinds of publications (e.g., treebanks, or syntactic databases for texts) and services (e.g., named entity identification services optimized for domains such as classical studies) and engage them in designing solutions. The project will also be relevant to areas such as medieval studies, archaeology, and ancient and near eastern languages. CLIR is seeking public comment on a literature review that identifies existing services, resources, and needs in the field of classics. The report, Rome Wasn't Digitized in a Day: Building a Cyberinfrastructure for Digital Classicists, was produced by Alison Babeu of the Perseus Project at Tufts University. It is intended to inform planning for the next phase of work: description of an infrastructure to support digital classics and related fields of research. (The report is a 1.8 MB .pdf file, please allow time for it to download). Comments on the draft report should be submitted to Kathlin Smith (ksmithatclirdotorg) by December 1, 2010. We especially encourage the identification of topics or projects that are missing in the report, or that might be represented more fully.